Crie sua própria lembrança durante uma oficina de mosaico de 3,5 horas em Roma. Independentemente do nível de experiência, é uma ótima atividade para crianças e adultos. Faça um curto passeio pelo bairro de Trastevere e depois desfrute de um workshop de lazer com seu professor. Escolha entre uma variedade de designs e deixe a criatividade fluir. Com um máximo de oito pessoas em cada aula, você recebe muita atenção pessoal do seu instrutor. Two grandparents mid 70s trying to entertain 2grandkids, ages 10 and 13, at the end of a long hot trip.......this was the PERFECT ending to our trip. We all enjoyed making our mosaics, and the fact that Gram was the slow learner here really tickled the kids. We loved meeting Dmitry and his wife, and Nadia, the expert mosaicist, was wonderful. She obviously loves her art and loves introducing everyone to the joy of mosaics. I will be booking a workshop for myself when I am next in Rome, even if I dont have kids with me! Also note: our mosaics were packed carefully for us and survived the trip home beautifully. This was a great way to enjoy yourself while entertains your kids, and it also made them appreciate all the mosaics and sculptures we had seen on our trip. It was the perfect finale to our 18 day trip together. The activity started with a quick tour of the area. Dimitri was our wonderful guide! 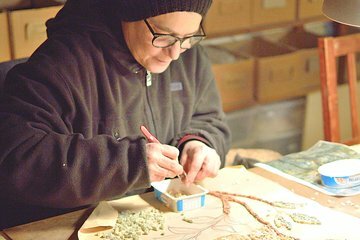 We went to the studio where Nadia, who is a master at mosaics, gave us a personal lesson. It was a real small group and we couldn't have been more pleased with that. Even though there was a small language barrier, Dimitri was a great translator, and we had the best time. There was great conversation and laughter all around. We would highly recommend this activity! !